New Delhi-based Ant Studio made a zero-electricity air conditioner to combat the brutally hot summers in India’s capital. 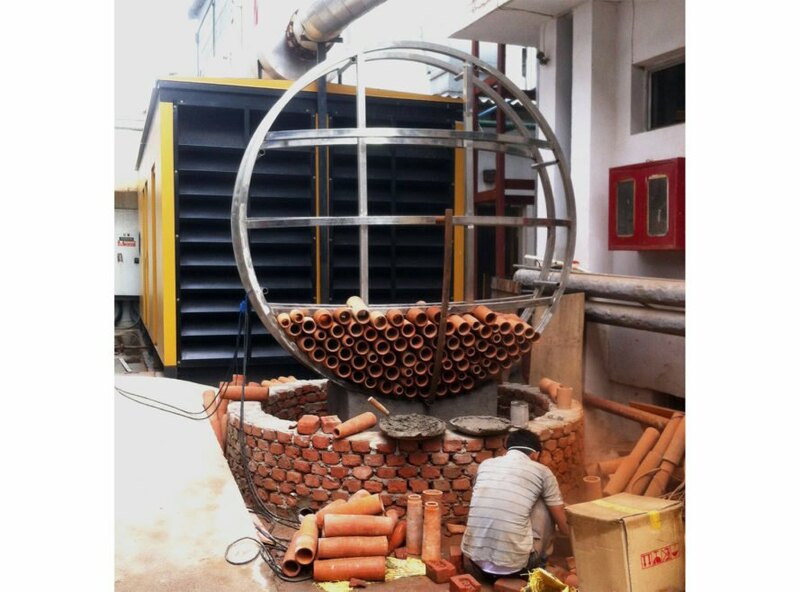 Built for a DEKI Electronics factory, this low-tech, energy efficient, and artistic solution to the sweltering heat harnesses the power of evaporative cooling. 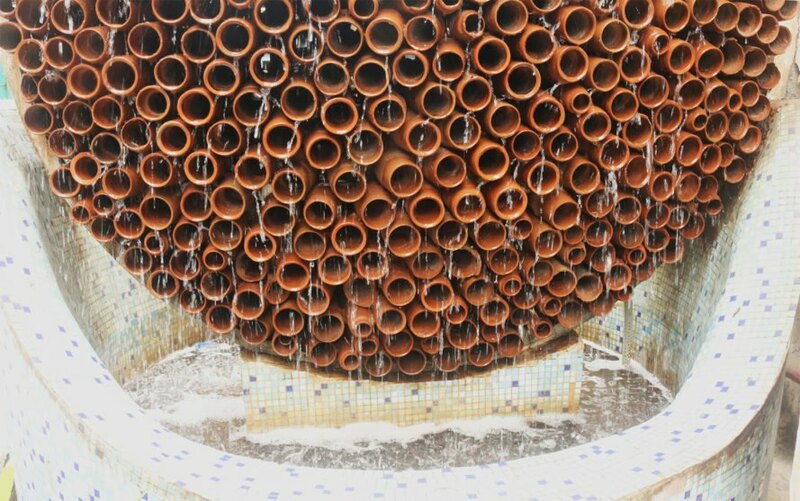 The innovative honeycomb-like installation is made with conical clay tubes that naturally reduce the surrounding temperature. Built as part of a larger beautification project for DEKI Electronics, the innovative cooling installation is highly functional and adds an artistic flair to the factory. The shape and size of the beehive-inspired structure’s densely packed terra-cotta cones were determined using advanced computational analysis and modern calibration techniques. When water runs down the structure—it’s sufficient to wet the cones just once or twice a day—the process of evaporation gradually lowers the air temperature. 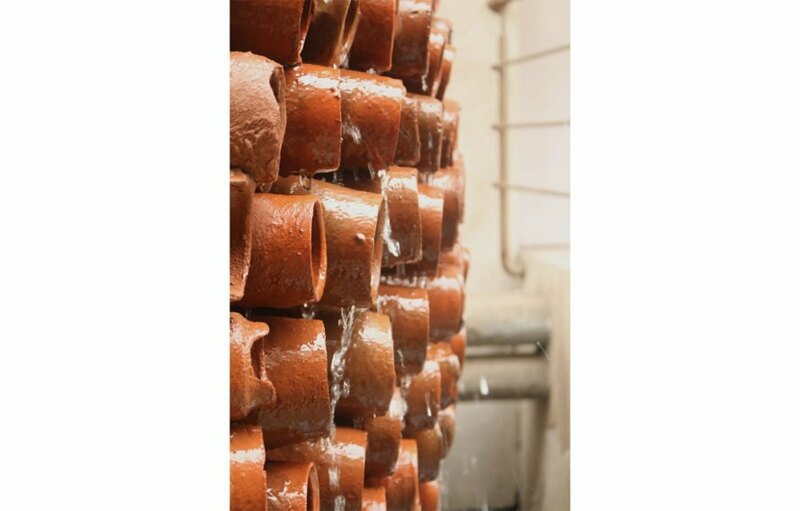 The porous terra-cotta units absorb water that then seeps to the outer surface where it evaporates and turns into cold air. The flow of water empties out into a collection basic and gives the installation a beautiful waterfall effect. The prototype is capable of cooling hot air at above 50 degrees Celsius (122 degree Fahrenheit) to temperatures of less than 36 degree Celsius around the structure, while atmospheric temperature drops to 42 degrees Celsius. 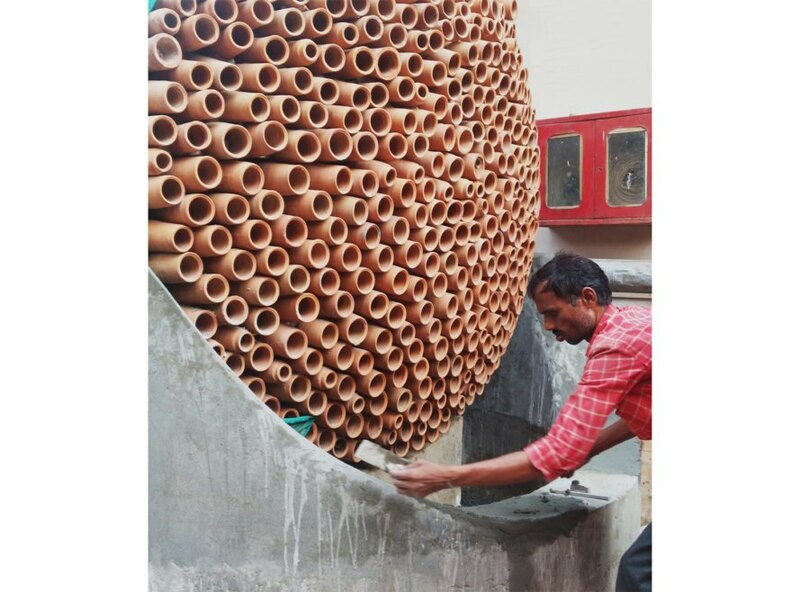 The architects see the honeycomb-shaped installation as a scalable low-tech solution for natural cooling, as well as an art installation that incorporates ancient craft methods. Energy seems to be required for the water to be pumped in or raised to the top, and then a fan or other air propeller looks to be needed to move the air. Also am I wrong or isn't this a legionnaires breeding ground? I mean, it's a nice evaporative cooler but it's not like it's zero energy unless I'm missing something. This will only work in areas with a dry climate. Use it in a moderate or humid climate and you will just end up feeling intolerably wet and sticky. In a humid climate it won't cool much (if anything) anyway. Also, if you start out at 50 degrees Celsius (122 degree Fahrenheit) and cool it to 36 degree Celsius, that's still 96.8 degrees Fahrenheit, which is still way above what most people would feel comfortable at. I've lived in moderate, humid, and dry climates. In the dry climate we had a swamp cooler. But it just didn't work well in temps above about 100-105F. Also, using a swamp cooler (evaporative cooling) is a different types of cooling than A/C. Although much cheaper to run than A/C, chances are it will be much louder than having A/C. That's because a swamp cooler usually sits on the roof or in a window and you can hear it running. Putting it outside like an A/C compressor would require more ducting and most people probably wouldn't spend the extra money on that. It also feels very breezy in your house all the time too, and you need to always have a window cracked for the air to escape. Some people don't like the breeziness. Sometimes there's a smell associated with swamp coolers too, which would I'm sure would be a potential issue with the type of cooling talked about in the article. This occurs from mold growth wherever the water is. When we had a swamp cooler sometimes the smell was a bit bothersome. In any case the pads have to be changed seasonally. I'm not sure how you would alleviate the mold growth in a system like the one in the article. You'd probably have to pressure wash it with bleach or something seasonally. But overall, the system in the article would only work in dry climates, and even then, you'd probably want A/C as a backup for whenever it got over 100-105F. Thank You Lucy for making me aware of the zero energy cooling system installed in Delhi. It is a brilliant concept. I have lived through the hot summers in Delhi. I wish someone had thought of this then! Terra cotta can harbor molds and fungi as anyone with terra cotta flower pots knows. What is the solution for this? Many with allergies or asthma cannot breathe mold-laden air. There are other serious health concerns also related to mold exposure. "Zero-energy" is misleading. It does require energy in the form of flowing water. Click-baity title. Besides that, I haven't crunched the numbers yet, but this seems inefficient. Evaporative cooling is highly dependent on the relative humidity in the air. Unfortunately, the places where we need this technology the most is often very humid, limiting its performance. I would love to see some real data on this. "Zero-energy" is misleading. It does require energy in the form of flowing water. Click-baity title. Besides that, I haven't crunched the numbers yet, but this seems highly impractical. Evaporative cooling is highly dependent on the relative humidity in the air. Unfortunately, the places where we need this technology the most is often very humid. It is great. There are still some scope for improvement. 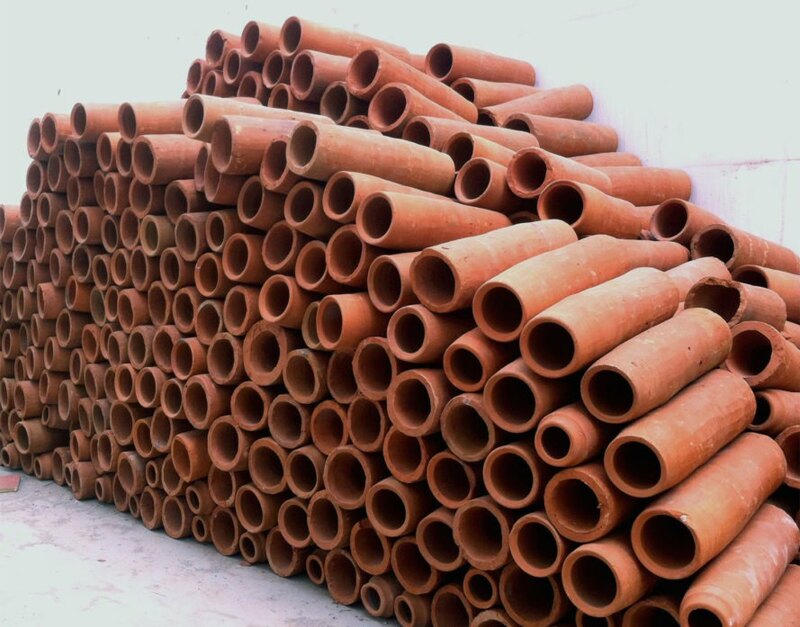 Make the earthen tubes longer. Make a provision for mixing wet air and dry air. Please also mention costs involved. 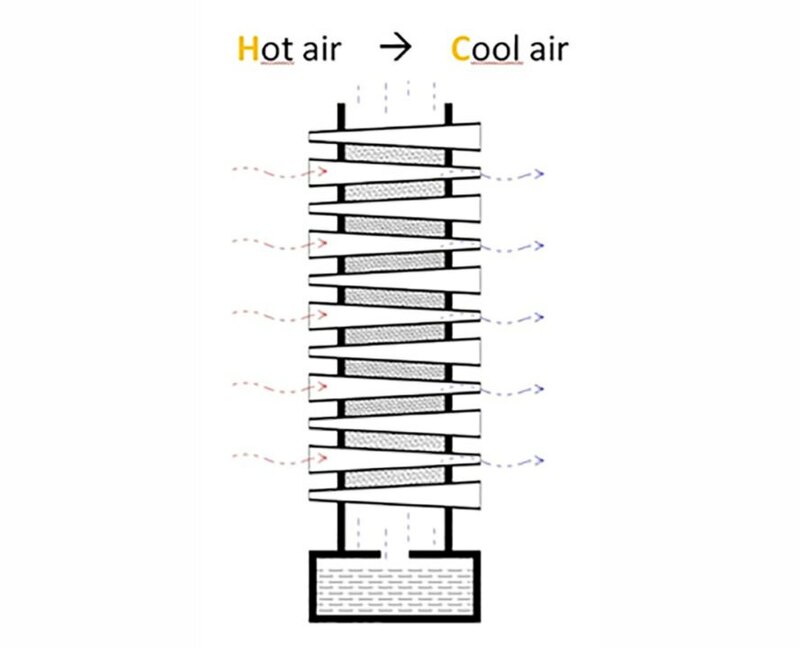 "The prototype is capable of cooling hot air at above 50 degrees Celsius (122 degree Fahrenheit) to temperatures of less than 36 degree Celsius around the structure, while atmospheric temperature drops to 42 degrees Celsius. " In Fahrenheit: "The prototype is capable of cooling hot air at above 50 degrees Celsius (122 degree Fahrenheit) to temperatures of less than 36 degree Celsius( 96.8 degrees Fahrenheit ) around the structure, while atmospheric temperature drops to 42 degrees Celsius ( 107.6 degrees Fahrenheit ). " That might be great to bring down the temperatures but not to replace air conditioning as we know it. Great idea for dry climates but perhaps a Legionella factory in moist climates? Requires a reasonably continuous water flow- perhaps intermittent would suffice? What if all the cones are placed with narrow opening facing inside. The flow will cause some air compression, and on release expansion of air will take place, this could further chill the air. This could act like a hybrid, external evaporative cooling, resulting in cooler cone surface for the air to flow over, and then expansion of the same air on entering the space to be cooled. Additional drop of around four to five degrees could be achieved, thus allowing reduced reduced water spray, to address the humidity issue, particularly during monsoons. Awesome. Quite possibly the future of A/C is solved. Evaporative (swamp) coolers work well in dry climates, but poorly in humid ones. Lovely idea and application but wouldn't the combination of porous clay, moisture and small dark places encourage dangerous mold growth? Built as part of a larger beautification project for DEKI Electronics, the innovative cooling installation is highly functional and adds an artistic flair to the factory. The shape and size of the beehive-inspired structure’s densely packed terra-cotta cones were determined using advanced computational analysis and modern calibration techniques. When water runs down the structure—it’s sufficient to wet the cones just once or twice a day—the process of evaporation gradually lowers the air temperature. The porous terra-cotta units absorb water that then seeps to the outer surface where it evaporates and turns into cold air. The flow of water empties out into a collection basic and gives the installation a beautiful waterfall effect. The prototype is capable of cooling hot air at above 50 degrees Celsius (122 degree Fahrenheit) to temperatures of less than 36 degree Celsius around the structure, while atmospheric temperature drops to 42 degrees Celsius. 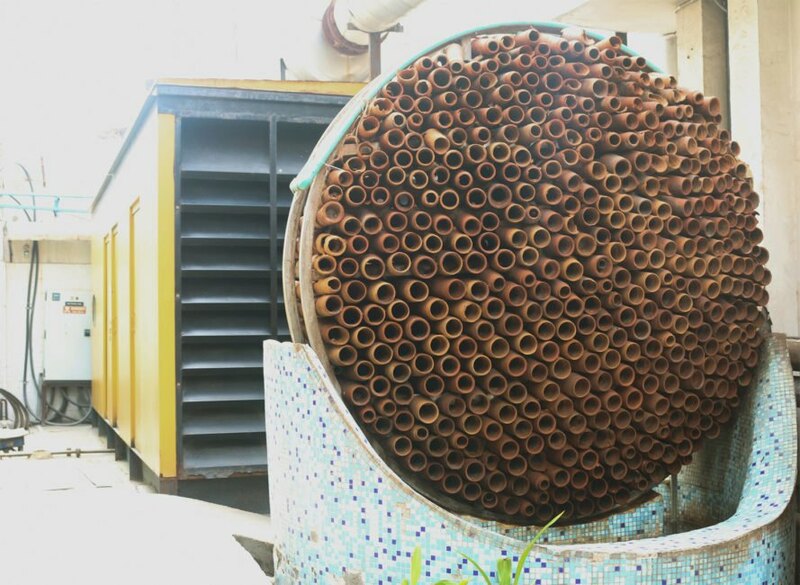 The architects see the honeycomb-shaped installation as a scalable low-tech solution for natural cooling, as well as an art installation that incorporates ancient craft methods.